Traded Life Policies (TLPs) or Life Settlements constitute one of the most interesting and exciting asset classes to emerge in recent years. They have the potential to deliver steady, positive returns no matter what is happening in the financial markets – an attractive proposition after the losses many investors suffered during the financial crisis – and have garnered the attention of investors the world over. This includes some of the biggest banks and institutions in the investment industry. United States-issued, life assurance policies sold before the maturity date to allow the original owner to enjoy some of the benefits during their lifetime. The transaction by which an existing life insurance policy is sold to third parties is known as a life settlement or traded settlement. A “whole of life” policy is one that pays out only upon the death of the life assured. Until that time, premiums must continue to be paid. Holders of such policies take them out for several reasons, but usually to provide for dependents in the event of their passing. Equally, holders often no longer have any reason to keep the policies after a period of time. Their children may have grown up and started their own families, for example. Many holders like to cash in their policies, perhaps to pay for healthcare or because they do not wish to keep paying the premiums. However, insurance companies often give little or no cash-in value for returned policies. Holders can usually get a much better deal by selling their policies in the life settlement market. In return for a market price, the new owners become the beneficiaries and continue to pay the premiums until the policies mature. The market for TLPs originally started as a result of the AIDS pandemic in the 1980s. A large number of people needed cash to pay for their care and a substantial market developed to meet those needs. TLPs sold on lives assured that have been designated as having a terminal illness or to be in terminal decline, with a perceived life expectancy of less than three years, are known as viatical settlements and these were the main type of policies traded in the initial stages of the market. Many of the AIDS-related policies proved to be a bad investment as life expectancy estimates were notoriously unreliable, due to the advent of new drugs that extended life expectancy. ‘Viaticals’ are still perceived as risky investments and the market has now gravitated towards senior life policies (over-65s), where life expectancy opinions are much more accurate. The TLP market has grown substantially since the early 1990s but there is still potential for much more growth. As life expectancy in the US rises over time, the chances are higher that people will outlive the usefulness of their life policies. Increased awareness of the TLP market is also likely to increase as more people realise they can get a better price for their policies on this market versus what they would receive by surrendering them back to the insurance companies. 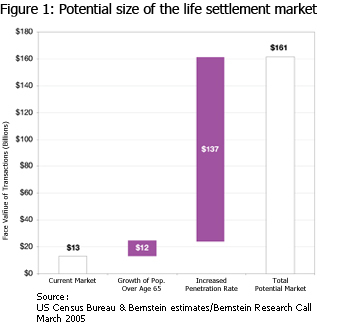 Figure 1 below shows how Suneet Kamath, writing in the Bernstein Research Call in March 2005, estimated the TLP market could grow from $13bn in 2005 to $161bn by 2030. His calculation was based on a rise in the US population aged over 65 to 72m by 2030. Kamath calculated that around 3% of all policies owned by the over-65s had been surrendered. This ‘penetration rate’ would imply an increase in market size of $12bn just because of the increase in the over-65s population. However, Kamath estimated that the surrender rate could reach 20%. This could add another $137bn to the TLP market, which would rise to $161bn by 2030. Investors, including managers of funds such as Managing Partners Limited, can buy portfolios of these policies, estimating the life expectancies of the policyholders using population mortality statistics and evidence of the assured’s health to gauge how much they should pay for policies in order to achieve a steady return. Prudent actuarial analysis and diversifi-cation are key requirements when investing in TLPs. If life expectancies are underestimated then this will impact returns, while a large number policies need to be purchased in order to spread the risk of such inaccuracies occurring. However, when portfolios of policies are handled correctly they can be used to deliver steady, incremental returns in all market conditions – this is because life expectancies do not change, irrespective of what is happening to equities, bonds, or commodities etc. This quality of delivering steady returns, year in, year out makes TLPs a highly attractive asset class to investors. For example, the Institutional Share Class in MPL’s Traded Policies Fund delivered a return of 99.94% net of fees from its launch date on 1st July 2004 to 15th July 2012, equating to an annualised return of 8.95%. This return was achieved over a period that included some of the worst financial conditions in history. However, investing in TLPs is a complicated process. Apart from the actuarial analysis, managers of funds that invest in them must also deal with risks associated with cash flow (liquidity), counterparty and currency risks. It is important for investors to understand what they are investing in so TLP funds are only suitable for sophisticated investors who use them as part of a balanced, diversified portfolio.